ŞCOALA GIMNAZIALĂ NR. 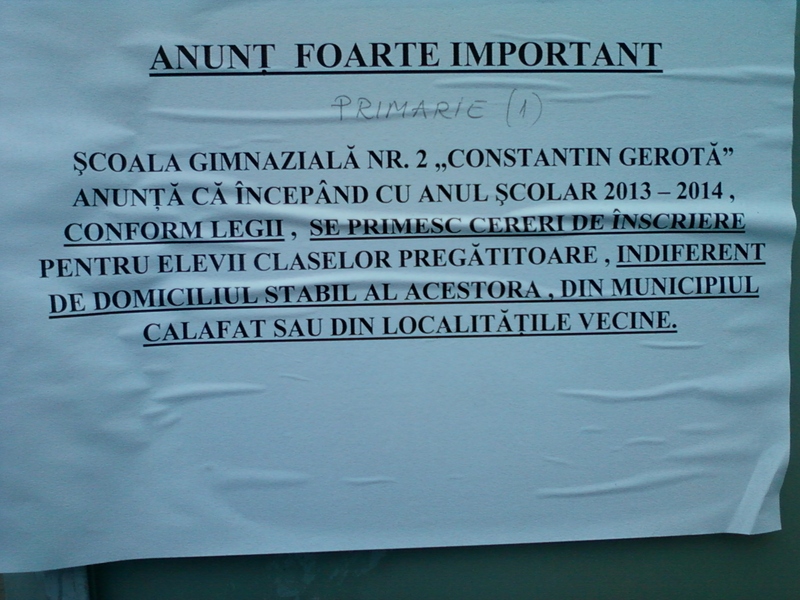 2 "CONSTATIN GEROTĂ". ANUNŢĂ CĂ ÎNCEPÂND CU ANUL ŞCOLAR 2013-1014, CONFORM LEGII, SE PRIMESC CERERI DE ÎNSCRIRERI PENTRU ELEVII CLASELOR PREGĂTITOARE, INDIFERENT DE DOMICILIUL STABIL AL ACESTORA, DIN MUNICIPIUL CALAFAT SAU DIN LOCALITĂŢILE VECINE.